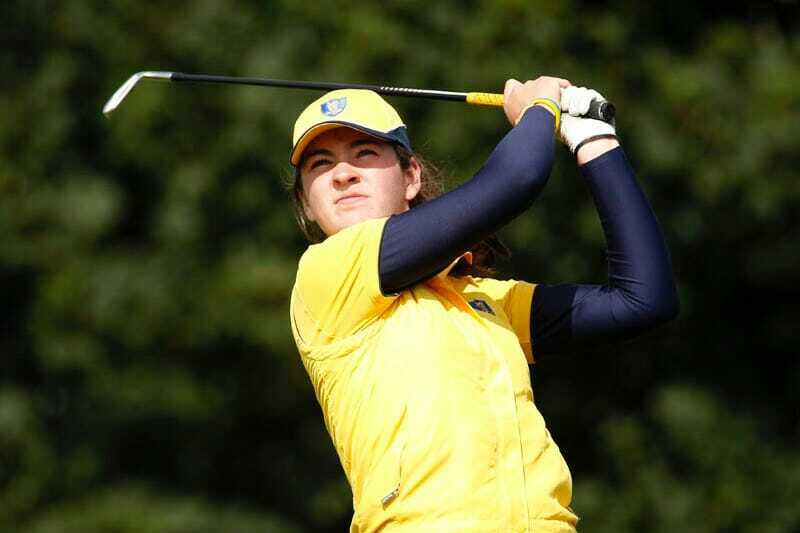 Leinster made their move yesterday at Shannon Golf Club in the Interprovincial matches and a win for both their girls and women’s teams today will ensure them of the double. The Leinster Girls continued their winning form against Munster and even superb play, including 3 birdies to start for the Donegan/Dawson pairing in the morning foursomes, wasn’t enough to overcome the strength of Leinster and they will need just a half with the Connacht Girls today to retain their trophy. The clash between Ulster and Connacht ended with Ulster on top. Wins for Kirkistown Castle’s Beth Coulter, Emma Forbes and Kate Dwyer contributed to their 7.5 – 0.5 win and they will be looking to overcome Munster in the final round to put Leinster under pressure to win their fixture. After a big win for the Leinster Women on Tuesday they faced the always battling Munster in their second match-up. Future Maynooth University teammates Ciara Casey and Mary Doyle won their test against Kelly Brotherton and home girl Lisa O’Shea 4&3 but Sarah Cunningham & Karen O’Neill levelled the tie when they beat Meadhbh Doyle and Molly Dowling by the same margin. Munster started quick in the afternoon singles, going up in 3 of the 5 matches. Cunningham and Brotherton got the first points on the board for Munster, however Meadhbh Doyle, Dowling and Coyle-Diez closely followed, winning their matches 6&4, 3&2 and 3&2 respectively, a 4.4 – 3.5 win for Leinster. Clodagh Hopkins and Hilary Hall got Connacht’s first point of the day when they carded a 1 hole victory over Niamh Ward and Jennifer Fawcett. Shannon Burke made it 2 from 2 in her singles when saw out Louise Coffey by 1 hole in the afternoon but wins for Ross, Fawcett, Weir and McSherry meant a win for the Ulster women. The final day see’s Ulster take on Munster and Leinster take on Connacht in both matches. A win for both Leinster teams would no doubt ensure the double for Mary Dowling and Stephanie McNiff’s teams, matches begin at 8am.